Messages "The Reign of Love"
CONSECRATION (Text excerps of the message "Only those with the seal..."
Jesus: "I NEED VICTIM SOULS"
THE WORLD IS COMMING TO AN END! THE END IS LOVE! My people, the people of My Love: I am your God. I am your Love. I am your Jesus Christ, I am the Holy Eucharist. I am not only present in the Holy Eucharist. I am the Holy Eucharist. The Mass you celebrate is Me. The Blood you drink is Me. The flesh you eat is Me. I am the Holy Eucharist. I am the Eucharistic God. I am the Eucharistic Love. No greater Love can anybody possess and give as the Eucharistic Love, which I give you in the Holy Eucharist. I am the Holy Eucharist. It has been My eternal longing to give Myself to You wholly and entirely. I created you out of nothing. I called you to be My people. I made you My own. Now My people, listen to your God. Now My people, come to your God. The Holy Eucharist is My gift of Myself to you. The Holy Eucharist is the gift of all that I have and all that I am in the simplest manner, the most comprehensive manner. I have given Myself to you. My Love, My beloved, My people. I, your God, have given you all that I am, all that I have in the Holy Eucharist. Why did I do that? It is because I am Love. I cannot but love. It is because I love you. I made Myself available to you in the simplest, most comprehensive form. My People: Do you understand what I have given to you? When I was washing the feet of My apostles at the celebration of the Eucharist, they did not understand what I was doing to them. I told them they would understand it later. And they did understand it to some extent. It is Love. It is service. order to redeem you from your sins. I give Myself to you in order to unite you to Myself. I give Myself to you in order to unite you to My Father. I give Myself to you in order that My Holy Spirit will live in you. I give Myself to you so that My Love will live in you. That is the same Love which is in Me, between Me and My Father, between Me and the Holy Spirit, the same Love will be between you and Me. I give Myself to you so that your Love for each other will be My Love, so that the Life in you will be My Life, the Love in you will be My Love. I give Myself to you to draw you and unite you to Myself. I give Myself to you so to unite you with all in Heaven; with all My angels and saints. I give Myself to you in order to change you, to change the face of the earth and to recreate you. At every mass there is a new creation, a recreation, a renewal, a complete renewal of all who participate at mass very, very devotedly, with open hearts and mind. They are completely taken up in light, in unapproachable light, in a wonderful light. They are all purified and sanctified. I have come to set fire in the world, how I wish it were burning. The fire of My Love. This fire will cleanse all evil. This fire will bring all good. It will remove every taint of hatred, wickedness and sin. This fire will establish the reign of Love in every heart, in every home, everywhere in the world. I have come to set fire in the whole world. How I wish it were burning. Let it burn. It should burn. It will burn. It must burn - the fire of Love. I am the Eucharist. The Holy Eucharist is Heaven in your midst. I am your Heaven. I am Heaven in your midst. You all want to go to Heaven, but Heaven has come to you. You all want to see Me, to see God. But I have made Myself visible to you in the Holy Eucharist. I am Heaven. I am your Heaven. Heaven in your midst. Do you expect to meet any person more glorious in Heaven than Me? Do you expect to get a joy more glorious in Heaven than from Me? My Church, My people, My beloved, love Me. Accept Me. Eat Me. Worship Me. Be with Me I am with you. The worst sin of My Church, the worst sin of My people, the worst sin of My beloved is the neglect of My Love, especially in the Holy Eucharist. The worst sin of My priests is to celebrate the Holy Eucharist without Love. The worst sin of My people is lack of belief in My Love in the Holy Eucharist. The worst danger to My people is forgetfulness of what I have done and what I have suffered for them in the Holy Eucharist. The worst danger to the existence of the world is what some stupid people say - is the abolition of the Holy Eucharist. Any move by any person or group of persons to remove or reduce the Love people should have for the Holy Eucharist is not from God. Any move by any person to remove or reduce the respect, the worship, the honour given to Me in the Holy Eucharist is not from God. It is the work of My enemy who does not want to see Me honoured; who has sworn never to see Me loved. My enemy is very active in some of My members. As he was active in Judas who blamed Mary for anointing My Body with oil, with precious oil. He suggested selling it and giving it to the poor. So (he thinks) that what is spent on Me is a waste. How can My people say that: that the time spent for Me is a waste? That the Love given to Me is a waste? How can My people say that? But there are many people who think that way today. They think they are proclaiming My Word. The time spent with Me, the time spent to Me..., everything given to Me by every person in the Eucharist is the greatest sacrifice you can make. To unite your sacrifice with Mine in the Holy Eucharist is the greatest sacrifice you can make. To come to Me in the Holy Eucharist; to stay with Me here; to love Me direct (in the Holy Eucharist) is the greatest possible act, the most glorious act human being can perform in the world. The reward is even infinitely more than any person can imagine. There is no greater Love than the EUCHARISTIC Love. There is no greater worship possible in the world than the Eucharistic worship. It is the Worship of HEAVEN: It is the worship of the TRINITY. It is the worship of God direct. I have made Myself available to you in the form of bread and wine so that you will have the easiest access to My Love, complete and absolute and direct. Please, My dear children, do not let anybody whatsoever distract your Love for Me in the Holy Eucharist. My Heart bleeds to see how children are being taught not to honour Me in the Holy Eucharist. I weep. Any celebration of the Holy EUCHARIST without Love is worse than My crucifixion. It is more painful to Me than the whole of My suffering, which I endured for you to the point of dying for you on Calvary. Any celebration of the Holy Eucharist without Love, without respect is so repulsive to Me, it gives Me such a terrible pain, worse than all the pains I suffered during My earthly life. Love the Sacrament of Love. Love your Love. Love your God. Love Me. Because I love you. Any unworthy reception of the Holy Eucharist is so repulsive to Me! More than any repulsion and rejection I have suffered during My earthly life. My people, why do you still let Me suffer? Why do you still crucify Me daily? When will I stop dying for you? When will I stop suffering for you? (Jesus weeps bitterly). When will I enjoy My Love for you? When will I start being loved by you? When will you start loving Me? Why are you still breaking My Heart? Any breaking of Bread without Love is worse than the piercing of My Heart, what the soldiers did. My people, love Me, call Me Love. Come to My Love. My beloved people. I will never stop loving you. I cannot stop loving you. I must always love you. Love is My law. Love is My life. Nothing pleases My Father more on earth than Love for Me in the Holy Eucharist, listening to Me in the Holy Eucharist, coming to Me in the Holy Eucharist. The greatest action of My Holy Spirit is My Incarnation. The greatest Action of the Holy Spirits is the transubstantiation of bread and wine into My Body and Blood. The greatest sacrifice, the greatest offering, the greatest participation of My Church in My salvific act is in the transubstantiation of bread and wine into My Body and Blood. The Church is truly My Church, My Church is truly My Church, My Church is wholly My Church, My Church is My Holy Church, My Church is faithfully My Church, My Church is sincerely My Church when My Church celebrates the Holy Eucharist. Any other act that My Church does comes from the Holy Eucharist and flows to the Holy Eucharist into the world. My Church, why are you forgetting your identity? Why are you forgetting your foundation? Why are you neglecting your roots? My Church, you are nothing without Me. My Church, anybody who tries to establish any form of worship that removes the Holy Eucharist, any form of worship that reduces the Holy Eucharist, any form of worship of God that does not flow from and flow to the Holy Eucharist is not from God, it is not from Me. My Father is present in every Holy Mass. My Father is present everywhere that I am. He is not present in the form of bread and wine, but He is present wherever I am. He is present to Me, for I and the Father are one - We can never be separated. My Holy Spirit is present at every Holy Mass. My Holy Spirit is present at every Eucharistic celebration - My Holy Spirit is present at every Eucharistic celebration. My Holy Spirit is present at every Tabernacle in the whole world - He is there for He is My Spirit. He cannot be separated from Me. He is not present in the form of bread and wine. It is only I, Jesus Christ, Who am present in the form of Bread and Wine. It is My Body. It is My Blood. My Father did not become man. My Father did not and will not become Bread - My Father did not change into wine, wine and bread, but My Father is always united with Me. He is always there, We are one. When you receive Me in the Holy Eucharist, you are receiving My Father, when you worship Me in the Holy Eucharist, you are worshipping My Father, when you receive Me in the Holy Eucharist, you are receiving the Holy Spirit. The greatest joy of My Mother Mary is to bring people to the Holy Eucharist - You remember the miracle at Kana. That miracle is a miracle that points to the Holy Eucharist. What did My Mother say: DO WHAT HE TELLS YOU! Because of the unity she has with Me, she knows the culmination of My salvific act and pointed Me to it. Everybody who loves My Mother Mary must love Me in the Holy Eucharist. The changing of water into wine is a foretaste, it is a pointer to the Eucharist. present, that My Body and Blood are there? Do they not believe anymore that I am God, that I am God the Almighty? That I can do everything? Oh, My people, if only you know how much you pain Me with your little belief... It is this little belief that would have let Peter be drowned in the sea. I asked him to come to Me. He actually started coming to Me, walking on the water, but then he began to doubt. I ask you to come to Me, come to My Love. Why are some people doubting that I am really present here? It is Me! Peter said: Lord, if it is You - ask me to come. He was coming with strength, but midway he began to doubt. Let Me assure you, the Holy Eucharist does not depend on your believing in it or not. It is not your faith that makes Me present in the Holy Eucharist. The Holy Eucharist does not depend on your loving Me or not. It is not your Love that makes Me the Holy Eucharist. The Holy Eucharist does not depend on your holiness, your purity or holiness. The Holy Eucharist, My presence there, that it is Me, does not depend on your believing in it or not. It does not depend on your loving Me or not. It does not depend on your worthy reception of Me or not. But your benefiting from it depends on your Love, on your faith, on your hope. Peter’s faith made him benefit from My presence and he was coming to Me over the water, then Peter began to doubt and began to sink. My people, do not doubt so that you do not sink. Do not doubt that I am present, that it is Me so that you do not sink. Come to Me with Love, receive Me with Love. Accept Me with Love. There is no greater joy for My angels and saints in heaven than to see Me honoured, respected, loved and received in the Holy Eucharist. Anybody who receives the Holy Eucharist with Love, purity and holiness is automatically in the company of the angels and saints. My Son, preach Me - My Son, defend Me. My Son, let the people realise that it is Me. The worst sin of My preachers today is not to preach Me, My presence, not to preach My honour, not to preach My holiness, not to preach My power of redemption - They preach weather, they preach change, they preach nothing. Please preach Me. It is Me who you should preach. It is Me whom you will proclaim. Any preaching that does not preach Me is worse than useless. Let all My priests preach Me, Let all My people come to Me. Let My whole Church receive Me. Let My whole creation worship Me. I am God in your midst. I, the Holy Eucharist, I am the life of My Church. I am the life of My people. I am the life of the world. I come that they may have life and have it in abundance. I give you everything I have, completely, absolutely, so that you may have life. My people live in Me. I live in You, for separated from Me you are nothing. Do not let anybody or anything separate you from Me. Let nothing whatsoever separate you from the Eucharistic Love, be it persecution or hunger or... Do not let anything whatsoever separate you from Me. What is it - sickness? That should rather bring you closer to Me, deeper in Me. Everything you do let it be done out of Love of Me in the Holy Eucharist. Come to Me daily. Daily Communion, daily Communion! I love it. I want it. Come to Me daily, do not stay away from Me. Come to Me, come and receive Me daily. If it is difficult for you to receive Me daily sacramental, then receive Me spiritually daily. But please, do not let any day go without receiving Me in the Holy Eucharist. Please do not let any day pass without receiving Me in the Holy Eucharist. If you cannot receive Me sacramental, receive Me spiritually. Wherever you are wish..., wherever you are, unite yourself to Me in the Holy Eucharist and I will come to you. Open your heart and your mouth and I will come to you. During the prayer of the Hearts of Love always wish to unite yourself to Me in the Holy Eucharist. When you say especially: "O Hearts of Love! Consume Me. I am your victim of Love!" it is Eucharistic prayer. You consume Me and I consume you. You eat Me and I eat you. You unite yourself to Me and I unite Myself to you. Whenever you are saying it, think of Me in the Holy Eucharist. Consume Me and I will consume you. You live in Me and I live in you. My Love for you grows infinitely more and more; Your Love for Me grows infinitely more and more when you live the Eucharistic Love. The love of the Hearts of Love is Eucharistic Love. It is from the Eucharist, it is from My Love in the Holy Eucharist that you draw life. Do not let anybody excommunicate you from Me. For cut off from Me you are dead. Do not let anybody or anything put you into sin, mortal sins are excommunications. By that you cut yourself off from Me. By that you are dead, dead in sin. But no matter how deep you fall into sin, open your heart, open your mind, open your Spirit to Me and say: My Jesus, I love. My Love. I love you. My Love! Call on Me: "My Love” and I will redeem you immediately, you will never be lost. There is nobody who calls on Me in Love who will get lost. No matter how deep your sin may be, no matter how long in sin you may be. No matter how forgotten in sin you may be: Call on Me in Love, no matter where you are and I am there. My Eucharistic presence in the Church is My omnipresence everywhere. The Holy Eucharist is the sacrament of My omnipresence. 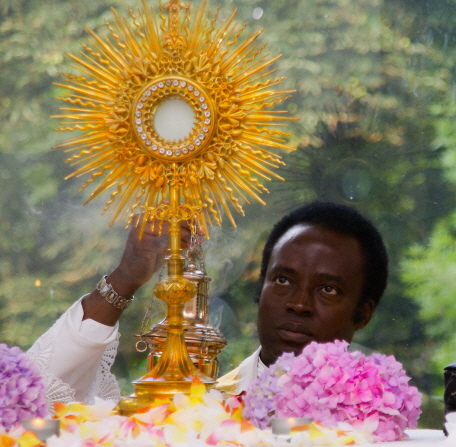 My Eucharistic powerlessness - I am there as bread that you can eat, touch, break, you can even throw away, you can even ignore, you can even say anything against and do anything against and I will be looking at you - is the sacrament of My Almighty power. I am God Almighty. Come to Me now and you will be with Me forever. Unite yourself with me now and you will unite yourself with Me forever. My Love is eternal. My Love is Me. My Love is eternal. My Love is Me. My Love I am. I am. I am. I am. I am He who am. Many people today think that they can do good works without Love and benefit from it. Just as faith without good works is dead so what people call good works without Love is dead. Good works will be done with Love. When you visit the sick you do it out of Love. When you help the poor you do it out of Love. There are many who visit the sick and inject in them lethal drugs and they kill them. There are many who help the poor and their help is to kill them. There are some who come to poor people as if they are helping them, but they make them slaves, they make them poorer, slaves. Good works without Love are dead. They are useless. It brings nothing. Do your good works out of Love. Love is selflessness. Do it for the good of the person. You do it out of Love for Me. I am Love. Let the life you draw from Me, the Holy Eucharist, flow into everything you do, everything you say, everything you think. "Bring people to the Love of Me." means: Love all with My Eucharistic Love and bring all to My Eucharistic Love, to the Love of My presence. (My God, I Love YOU.) The Love of My unity. The Love of My unity with him - to unite him to Me. Unite all to Me. All will be All. All will be one. All will be one and all in Me. I am the One and the All. All will be one in Me.